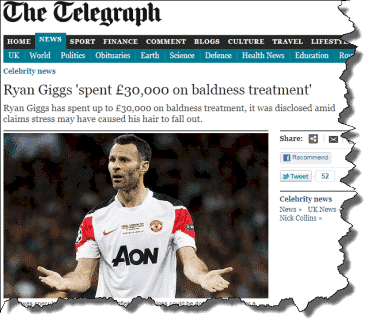 Ryan Giggs is back in the news…AGAIN…! He has he been accused of not being able to keep his trousers up, and it now transpires he has also spent £30,000 on trying to stop himself going bald (allegedly). Another day, another Ryan Giggs revelation; it looks like it won’t be long before his sponsors announce they are not renewing their contracts with him, thanks to the negative publicity he is getting. But did you really need the newspapers to tell you he was having several bad hair days? Even if you are not a football fan, you’d probably be familiar with his mugshot – after all, he is one of the world’s most decorated footballers and has usually been in the newspapers for scoring goals, loving his teams (Manchester United and Wales) and being a UNICEF Ambassador helping bring attention to the damage done by land-mines. That means even if you didn’t notice it much, you may well have been aware of his seemingly changing hair length. You paid no real attention to it – but were probably aware of it; just check out his earlier pictures and compare them with him now. And that’s the issue – often we are aware of things that we don’t actually know we have paid attention to. New research from the Singapore Medical School shows us in an interesting way that we see things for which we have no recollection, yet we are aware we have seen them. In other words, attention and awareness are different things. For your website this means people will be aware of things even if they have paid no attention to them. That means you may be trying to hide things on web pages – such as page traffic counters, or affiliate links – which appear relatively invisible, say down the bottom of the page…but your website visitors will notice them even if they pay no attention to them. And that means they’ll be aware of things you are trying to hide. Alternatively, it also means they will be aware of good things which they also “don’t see”, such as your badges of recognition, perhaps collected in a footer which your traffic analysis shows no-one clicks on. But your visitors will be aware, even if they have paid no attention. So, contrary to many web design recommendations, perhaps you should load your pages with material that you do not want people to pay attention to; instead you just want them to be subconsciously aware. It could be material that enhances your credibility in a footer, for instance. Or it could be small images that highlight your products and services in some kind of display banner that people effectively ignore in order to get to your real content. In other words, there are several creative opportunities for you to get awareness of your messages without having to ensure people pay attention to it. Eye tracking studies tell us that people only pay attention to portions of a web page. But this new research suggests that they will be aware of the rest of the content even if they did not attend to it. That means you have the opportunity to convey information subconsciously to people about the kind of business you operate. Don’t neglect these “non attentive” parts of your web pages – your visitors are aware of them even if they don’t think they are. Just like the fans of Ryan Giggs who are now all saying “oh yes, I thought his hairline was receding” your website visitors will “know” things about you they didn’t even pay attention to.